Tescha grew up on her home world of Ferro. The traditional Ferroan lifestyle is one of combined independence and reclusiveness, but Tescha’s strong sense of independence lead her to become distant from her peers over the years. Once she reached sixteen standard years of age (the age of adulthood in her culture), she left the planet on her Uncle’s freighter and began to explore the galaxy. 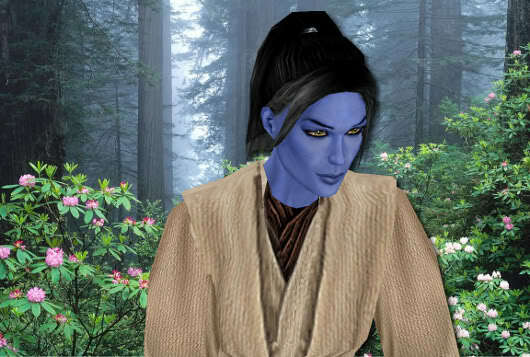 She roamed from system to system, eventually running out of credits to travel when she arrived on Coruscant. Her people are very aware of the lifeforces around them, especially what they called the “breathing of the planet”. Tescha became depressed at the prolonged exposure of a cold, metal world, and took to wandering the streets at night. One fateful, night, Tescha was walking down an alleyway on the lower levels when she felt a tingling on the tip of her forehead, and then felt an urgent need to move away. She leaped sideways into an enclosure between a few crates, just in time to miss an out of control speederbike that whizzed past her. She had no time to recover from the shock before a cloaked figure dropped down in front of her from an upper terrace. “I’ve been watching you for a few nights, girl.”, he said. “I’ve felt the Force flowing gently in the back of your mind, and have been waiting for it to surface. “The man simultaneously stepped from the shadows and pulled back his hood, revealing an older face with long silver hair. “What is the Force?”, she asked, her compulsion to run dulled by her curiosity and confusion. The thought of staying on Coruscant for another cycle was upsetting, let alone a few years. He read her thoughts.